Similar to a creme brûlée, crema catalana is a traditional catalan dessert also known as Crema de Sant Josep. It is very light and delicate and typically served in restaurants in Catalonia. It is a really simple dessert to make at home but it does require a torch flame or a broiler to caramelise the sugar sprinkled across the top. We had a real wonderful version in La Pepita in Barcelona and at Can Roca in Girona. So is there any difference? Yes! Crème Brûlée is French while Crema Catalana is Spanish. 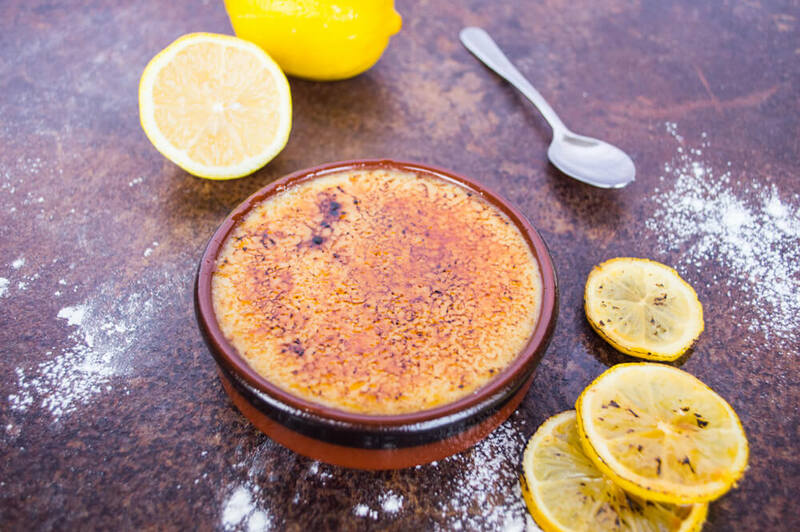 Although, they are both made with eggs, milk and sugar and presented in a ceramic bowl with caramelized sugar on top, their main difference is that creme brûlée has cream while crema catalana does not have any. Corn starch is also a major difference. The texture of crema catalana comes from corn starch and it is cooked stirring at low heat over the stove whereas crème brûlée does not not any contain corn starch and is usually cooked in a bain marie in a low temperature oven. Makes about 700g. Enough for 5 portions of about 140g each. Beat together the egg yolk and sugar until blended and frothy. Add the cinnamon, lemon skin and the milk. Slowly heat the mixture; stirring constantly until it begins to thicken. Remove the cinnamon stick. Divide the custard into 5 individual dishes and leave to cool completely in the fridge for a couple of hours. Before serving, sprinkle 5g of sugar on the top of the cream and caramelize with a torch flame or by using your oven’s broiler. It can serve right away or wait for a couple of hours but not too long in case the sugar on top softens. Variation: Vanilla and orange makes a delicious substitute for the cinnamon and lemon.